The Federal Reserve was ‘created in 191J” after a series of bank failures in 1907 convinced Congress that the United States needed a central bank to ensure the health of the nation’s banking system. Today, the Fed is run by its board of governors, which has seven members appointed by the president and confirmed by the Senate. The governors have 14-year terms. Just as federal judges are given life time appointments to insulate them from politics, Fed governors ‘are given long terms to give them independence from short term political pressures when they formulate monetary policy. Among the seven members of the board of governors, the most important is the chairman. The chairman directs the Fed staff, presides over board meetings, and testifies regularly about Fed policy in front of congressional committees. The president appoints the chairman to a four-year term. 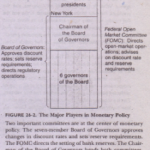 As this book was going to press, the chairman of the Fed was Alan Greenspan. who was originally appointed in 1987 by President Reagan and was later reappointed by Presidents Bush, Clinton, and Bush. The Federal Reserve System is made up of the Federal Reserve Board in Washington, D.C., and twelve regional Federal Reserve Banks located in major cities around the country. The presidents of the regional banks are chosen by each bank’s board of directors, whose members are typically drawn from the region’s b~g and business community. The Fed has two related jobs. The first is to regulate banks and ensure the health ,of the banking system. This task is largely the responsibility of the regional Federal Reserve Banks. In particular, the Fed monitors each bank’s financial condition and facilitates bank transactions by clearing checks. It also acts as a bank’s bank. That is, the Fed makes loans to banks when banks themselves want to borrow. When financially troubled banks find themselves short of cash, the Fed acts as a lender of last resort-a lender to those who cannot borrow anywhere.else—to maintain stability in the overall banking system.